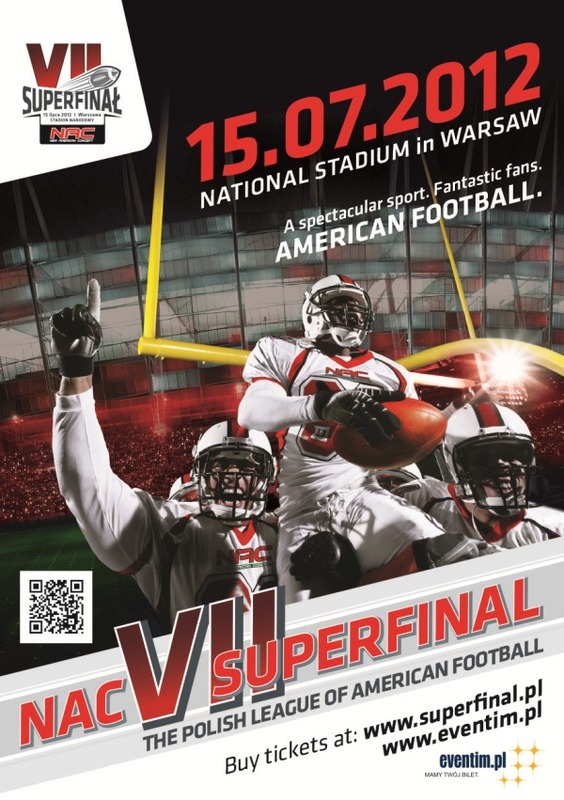 The seventh season of competition in the Polish League of American Football will be launched in Warsaw on Saturday, March 24, when the Warsaw Eagles host Kozły Poznań. The structure of the PLFA has been completely reorganized this offseason. Six teams will participate in the newly-established Ekstraklasa, eight teams will play in the two-division PLFA I and 13 teams will take part in PLFA II, which will also be divided into two divisions. In addition to Kozły and the Eagles, the Wrocław Devils, Krakow Tigers, Gdynia Seahawks and Silesia Rebels will also take part in Topliga play this season. The Rebels team arose from a merger between the Silesia Miners and the Ruda Śląska Warriors. The second-oldest team in Poland, the 1. KFA Fireballs Wielkopolska, joined forces with Kozły, and the new team formed will play under the latter's title this year in the Ekstraklasa. 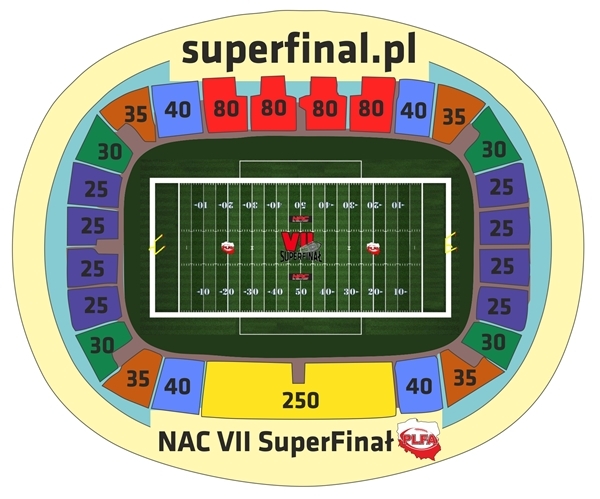 Buy your ticket for NAC SuperFinal VII today! Teams in the Ekstraklasa will play two games against each of the other five teams in the league. The four best teams at season's end will advance to the semifinals, planned for the weekend of June 30-July 1. 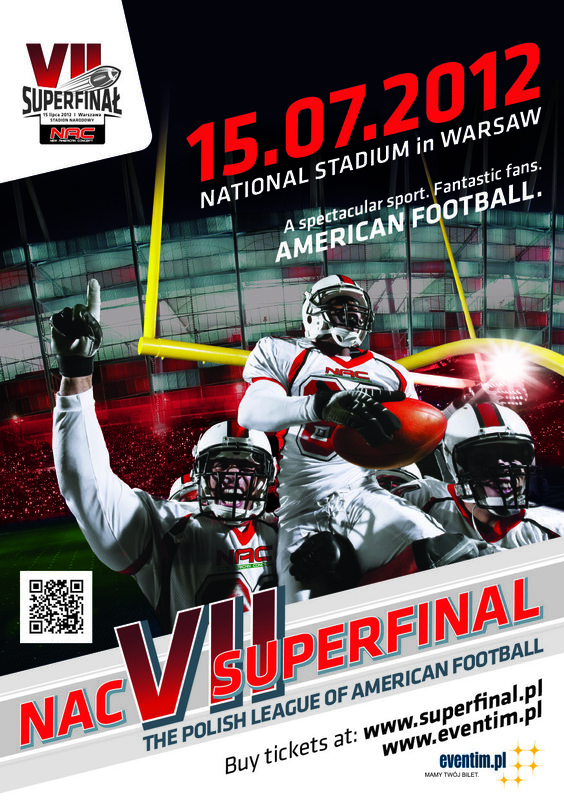 The ultimate game of the season will be PLFA SuperFinal VII, to be played on Sunday, July 15 at the new National Stadium in Warsaw. Last year's SuperFinal VI, which was played in Bielawa in Lower Silesia, was the first Polish game shown live on television. The transmission was seen on television on Sportklub and on the Internet through ipla.tv. PLFA I will be divided into two groups for 2012 - the North and the South. Each team will play the other three in its division twice, with the top two teams from each division reaching the semifinals. The PLFA I season will conclude on August 4, with the inaugural PLFA Cup game determining the champion. Playing the SuperFinal at the National Stadium will be the next breakthrough for the League, after last year's televised final. 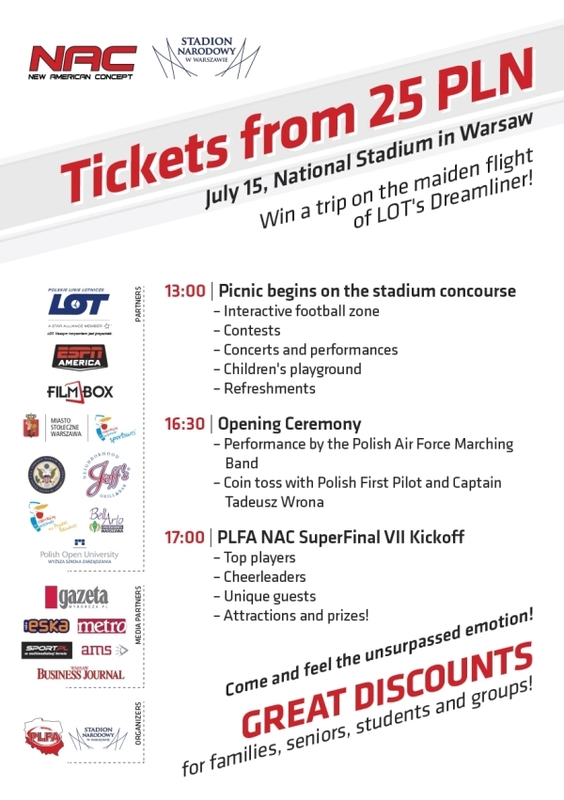 The success of this event could bring football in Poland to previously unseen heights. Organizing SuperFinal VII in the most modern stadium in Europe is going to be a challenge, but I believe it will be one that we can meet successfully. In the lowest level of 11-man Polish football, PLFA II, 13 teams will be split into North and South Divisions. Each team will play 6 games throughout the season, which begins on May 5. As in the upper two divisions, four teams will advance to the playoffs, including two from each division. In addition to playing for the championship, to be held on October 6, the two finalists will be guaranteed a spot in PLFA I for the 2013 season. Overall, the 2012 PLFA season will see 27 teams from 21 cities compete in the three divisions of play. Just a year ago, there were only 22 teams from 17 cities playing 11-man football in Poland. 102 games are scheduled to be played altogether in the Ektraklasa, PLFA I and PLFA II. In the upcoming season, the teams in the three divisions will travel more than 43,000 kilometers, the equivalent of more than the distance around the entire world. Six new teams will make their debuts this season: the Szczecin Cougars, the Warsaw Królewscy, the Rybnik Thunders, the Sopot Sabercats, the Toruń Angels and the Olkusz Silvers. Warsaw will be the best-represented city in the 2012 season, with the capital sporting four separate teams: the Eagles (Ekstraklasa), the Spartans (PLFA I), the Królewscy (PLFA II) and the Werewolves (PLFA II). Three other cities, Krakow, Szczecin and Wrocław, will support more than one team this season. The Tigers (Ekstraklasa) and Knights (PLFA I) will play in Krakow, Husaria (PLFA I) and the Cougars (PLFA II) will take the field in Szczecin and Wrocław will support the Devils (Ekstraklasa) and the Diabły (PLFA II). One other Polish team, the Wrocław Giants, will play this season in a Czech league. In addition to the 11-man leagues, the second edition of the 8-man PLFA 8 league will begin this August. The PLFA 8 season format and schedule will be published at a later date, although at least 12 teams are expected to take part. Another exciting development this autumn will be the introduction of junior tournaments. Youngsters will be able to develop their skills on 8-man teams. The PLFA was founded in 2006. That first year of competition featured only four teams competing in the national league. The 2012 season will feature 27 11-man teams. Overall, there will be five levels of competition: Ekstraklasa, PLFA I, PLFA II, PLFA 8 and junior tournaments. The highlight of the season will be the Ekstraklasa's SuperFinal VII, to be played on July 15, 2012, in the new National Stadium in Warsaw.